Take a standard Acura NSX and replace as many aluminum parts as you can with light-weight carbon fiber, increase engine cooling with an enlarged hood vent, slap on some sticky Pirelli race rubber along with more downforce up front (carbon fiber canards and front splitter) and out back (big carbon fiber wing and underbody diffuser) and what you’ll get is pictured above, the Acura NSX GT3 race car. 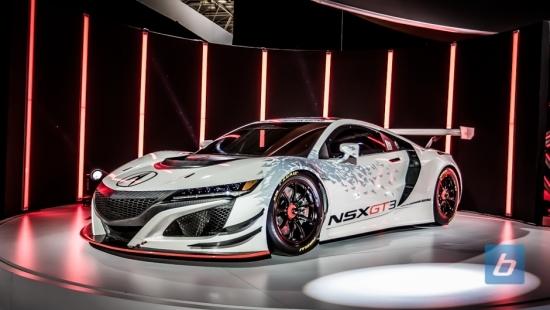 Acura says the NSX will undergo homologation this fall as an FIA GT3 class race car. While the engine remains unchanged with the 3.5L twin-turbo V6, it will be paired with a 6-speed, sequential-shift racing gearbox, delivering power to the rear wheels. You may not be able to get your hands on one of these GT3 variants, but the production version of the NSX is just starting up now as orders began last month. If you want to see more pictures of the NSX GT3, check out our gallery. 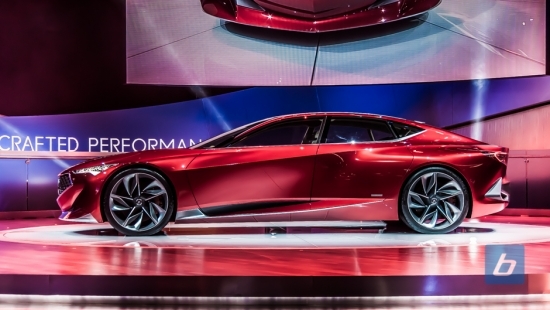 Acura revealed the much anticipated Precision Concept this morning at the Detroit NAIAS, a design model that forms the basis of future Acura products around what Acura calls Precision Crafted Performance DNA. What’s more shocking is that the Precision Concept looks a lot like the Lexus LF-LC concept, and the LC500 that was unveiled yesterday. Designed at Acura’s California Design Studio, the Precision Concept is low, wide, and large. Striking features such as floating LED taillights gives it a futuristic look, while sculpted side surfaces convey a bold and aggressive feel to the concept. Inside the Precision Concept is a cabin that looks and feels more like an upscale lounge. Even the speaker grills are crafted from exotic wood. Check out or photos live from NAIAS floor after the jump, and tell us what you think. Acura already planning NSX Type R? Acura just took the wraps off the production version of its long-awaited new NSX, but rumours are already circulating of an even hotter version to follow. 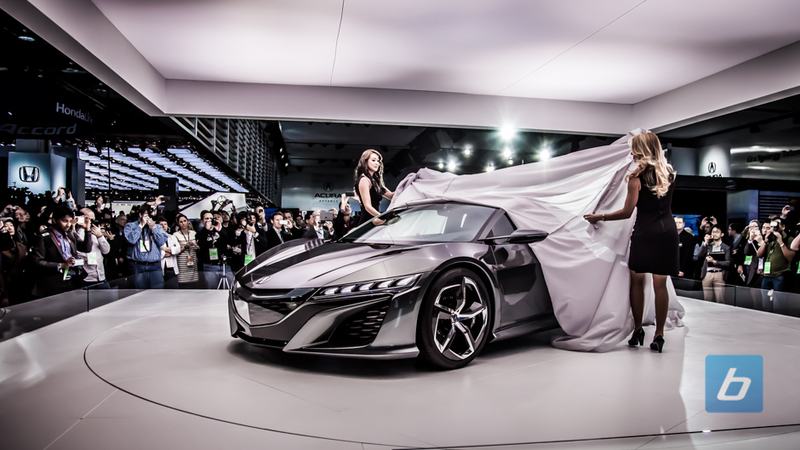 After first showing a concept three years ago here at the same Detroit Auto Show, known as the North American International Auto Show, Acura has finally lifted the veil off the production version of the 2016 Acura NSX. The new hybrid powered supercar is the new halo car for the brand, and while production numbers will be limited, the hope is that every one will want one. First things first, as you can see from the pictures it actually doesn’t look too far off from the last NSX concept that Acura showed off. The front lower fascia is pretty bang on, but is now shown off in a beautiful two toned finish. The low profile grille looks to be unchanged as well from the concept and the headlights have been given the trademark jewel eye Acura look. The large airvents atop the hood are much larger and were necessitated by the amount of heat put out by the twin turbos. Down the side the vent behind the door has actually been flared out a bit more and extended slightly lower. Usually going from a concept to production, design elements like these are toned down a bit, not the other way around but it is a welcome change and gives the NSX a much more appealing look from the side. Out back, the rear end styling however has been toned down ever so slightly with the side exhausts replaced with a center mounted quad pipe setup. In it’s place are a set of LED rear foglights. The taillights look completely identical to the concept version, with a cleaner looking reverse light insert. Under the hood, my guess of just over 550 horsepower seems bang on. The twin turbo V6 along with its three motor electrical power unit will be mated to a 9-speed DCT transmission. Compared to the concept version, the production NSX was lengthened by about 3 inches and widened by about 1 inch to accommodate the longitudinally mounted twin-turbo V6. Although to be honest, I wouldn’t have noticed without being told. 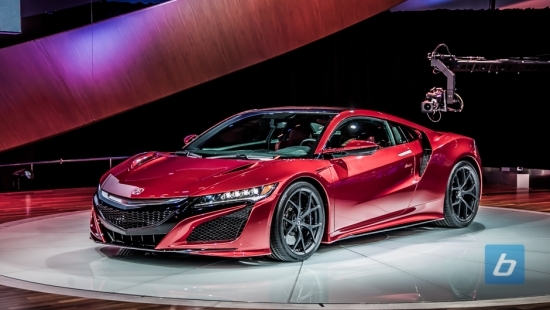 You’ll be given a pass if you’ve been suffering from Acura NSX news fatigue. It seems that Acura has been talking about the return of this thing for as long as the original version lasted. That may be an exagerration, but it all started with an interesting concept vehicle in the Avengers movie that looked much like the prototype drawings released by Acura at the time of the upcoming NSX. We saw an official NSX Concept vehicle at the 2012 North American International Auto Show in Detroit, and an updated version a year later at the same show. It went quiet for a bit as Acura mentioned the NSX at the unveilings of what seemed like every new model, including the new MDX. Acura had shared their vision of a hybrid powertrain several years back but it wasn’t until late 2013 when we learned it would be powered by a twin turbo V6 with a rumored 550 horsepower under the hood. So, 2015 is here and the 2015 NAIAS is just around the corner. What are we expecting to see from Acura? With all the hype they certainly have their work cut out for them as the masses will be expecting a glitzy unveiling of the 2016 Acura NSX. Are we going to see a 550 horsepower AWD hybrid beast from Acura? How many “jewels” will be featured on the headlights? Will it even look like the concept? We have staff on site that will be capturing it from every angle to answer those questions so check back next week for more NSX news! So I recently turned 30. This doesn’t mean I’m the oldest person in the world, but I’ve clearly crossed the threshold into really ridiculously old people who enjoy things like porridge and a good sit. How do I know this? I just came from an Acura presentation thinking “Hmm, neat”. Modern Acuras are boring. This is a fact of life almost as old as I am. If you were to ask somebody to draw a normal car, whatever scraggled output they presented would resemble an Acura. When the new RLX and TLX were revealed, I said the same thing. I talked about how much more I respected Lexus for releasing a bold new design. I said that I don’t care if Honda keeps pushing out boring cars, I just wish they’d stop pretending the white rice they put in showrooms is exciting. I posited that these cars are for boring people who pretend they know what a fun driving experience is. This year Acura repeated the same schtick for a third time except, prior to the reveal, they droned on about the TLX instead of the NSX. They emphasized that Acura listened to the fans, who apparently love the exterior, and made the ILX more fun, more luxurious and more technological. I don’t know who these people are, but I’m skeptical of any claim where people are okay with Acura’s current styling. Anyway, the new ILX grabs the 200 horsepower 2.4L and 8 speed DCT avec torque converter from the TLX, along with a handful of AcuraWatch safety features. New technology includes a smartphone-managed nav system in addition to the onboard unit. There’s even a new top-of-the-line A-spec with bigger wheels and Acura’s attempt at sporty styling. Due to my transition from doe-eyed youth to stick-ball aficionado, I left thinking “Huh. I’m gonna drive one as soon as I get the chance”. “So what?”, you ask. “Wanting to drive a car is a perfectly logical response to seeing a presentation about it”. Wrong. 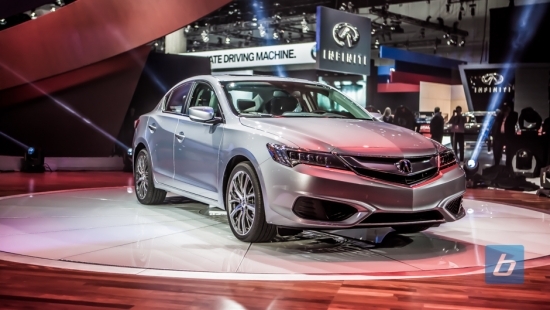 Wanting to drive the ILX implies that I think it’s capable of living up to its own hype. This is awkward and unfamiliar territory for me. The car is just the same as ever. It looks like an Acura, it feels like an Acura, it’s under-powered like an Acura, it’s got all the features from the other Acuras. Clearly I’m the one who’s changed, and that’s scary. It means my thoughts are not my own, I’m just a demographic. I’m no longer an 18-29 white male, I’m a 30-DEAD white male. Perhaps when I slip into the grave, it will be from boredom while driving the new ILX. Or maybe it’ll be from hooning it off a cliff. I don’t even know anymore.